Most Creepy.com - Annabelle 2 in Indonesia has been broadcast in theaters since August 9, 2017. In its broadcast, there was a horrendous incident precisely in Banjarmasin. A woman reportedly possessed while watching this Annabelle: Creation horror movie. A female audience suddenly shouted hysterically when watching Annabelle's movie in studio 6 XXI Duta Mall, Banjarmasin, Indonesia, on Thursday, August 10, 2017. The incident occurred around 9:30 p.m. The audience was confused to see a woman was lifted out of the theater room. The widely spreaded video is posted by @wargabanua's Instagram account. A lot of people commented in the video comment column. "The original creeps all the way to the feet" commented from @ gytaaa96. "It is so scary that made someone possessed" commented the @ siskanababan04 account. But many also commented negatively on this tragedy. Many consider that women are more like never watching horror films. "The movie is also not so scary ... just a lot of scare jumps. I was shocked." commented Gabriel Chandra on Youtube. 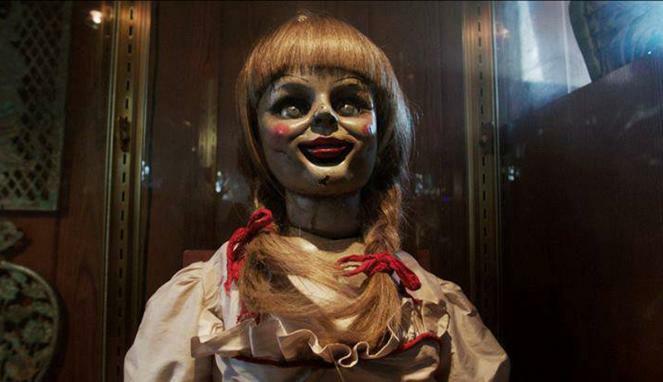 Annabelle's second movie actually tells the story of the origin of the Annabelle doll. So you could say Annabelle 2 is a prequel from Annabelle, or the previous story from the first Annabelle film. What do you think? Is Annabelle 2 really really scary?